Take a peek at this Blush Floral Wrap Dress with Ruffled Hem. We're obsessing over the floral print and wrap style! Must have maxi dress! Approx. 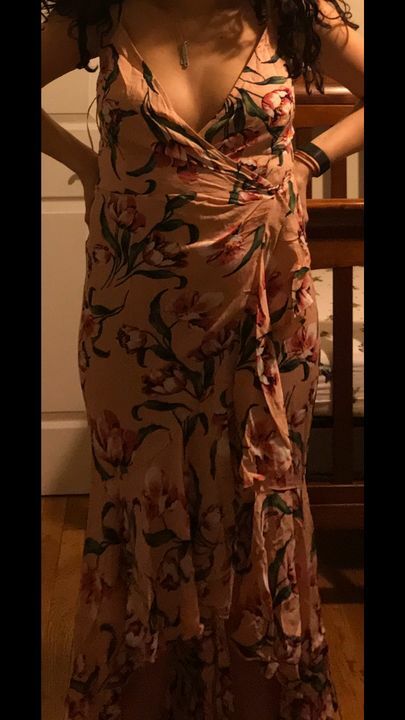 Length (shoulder to bottom hem): -Small: 60" -Medium: 61.5" -Large: 62"
Chantel M. Reviewed by Chantel M.
This dress looked super cute online. I bought this and had to return. The coloring was a duller and less vibrant pink than shown on the model. It also didn’t fit very well. Awkward dress for me. May work better for others. Noelle C. Reviewed by Noelle C.
Kristin M. Reviewed by Kristin M.
Very flattering. Will be perfect with strappy heels. I wish the straps were a little thicker as I will have to wear a bra, but overall very happy with it!